The power and direction of the jet streams arise through the accelerating effect of pressure changes in the upper atmosphere and the Coriolis force generated by the Earths rotation. The Coriolis force deflects winds in the northern hemisphere to the right and winds in the southern hemisphere to the left. Meteorological science has shown that the jet streams are so fast because they arise in the upper atmosphere, far from the surface of the Earth. This means that they are subjected to almost no friction; experts speak of geostrophic winds. Consequently, very little energy is required to initiate and maintain these airflows. It is precisely this low energy requirement that limits the potential for using the jet streams as a source of renewable energy, explains Axel Kleidon, head of the Independent Max Planck Research Group on Biospheric Theory and Modelling. Based on atmospheric energetics and using climate simulation models, Kleidons group has calculated the maximum rate at which wind energy can be taken from the global atmosphere. According to their estimates, the jet streams have an output of just 7.5 terawatts (one terawatt equals a million megawatts). This means that they generate 200 times less usable wind energy than stated in previous studies, and only about half of humankinds primary energy requirements, which totalled about 17 terawatts in the year 2010. Harvesting wind energy at that alatitude is impractical anyway. The other thing is, their theoretical power calculations are incorrect anyway. That would even be an over-estimate for 90km surface winds at 1 atmosphere pressure, because that would only be 9300 Watts/meter squared. At altitude, the air is much less dense so there is much less MASS in the air, which means any given velocity wind has much less energy. They didn't even adjust the power formula for the correct density of air at that altitude. Ghost Tard will attack me now, so I make a link for his slow mind. We should always consider the hidden cost of so called the "renewable energy sources" - they're often diluted and unreliable, the cost of energy conversion, transportation and storage must be taken into account. They're relatively material hungry and these raw sources cannot be recycled so easily. In addition, the environmental pollution (including the acoustic and radiowave noise smog and threatening of air transportation) will make them uncompetitive even with comparison to traditional energy sources, not to say about cold fusion. Why only try for wind though ? If you have the ability to put stable turbines up there, why not try for more than just wind ? Why not to try the cold fusion, after then? Why the people must check every stupidity first before choosing the most economical solution? Is the research here for better employment and play of technicians and scientists involved - or is it rather a service for the rest of human civilization? I've nothing against playful experiments and free art - but after then the scientists should be payed like the artists and performers from privately collected money - not like the governmental officers from mandatory fees. Tell me how you'd replace all the jobs lost in the various energy sectors Rawa . It would be devastating to economies world-wide. Just like legalizing drugs would bring many countries to their knees. @Issacsname: first off, in Rawa's fantasy world of cold fusion and over-unity the jobs lost in the energy sector are meaningless noise in an economy that would suddenly be orders of magnitude more efficient. Only one problem, cold fusion is 99% fantasy and 1% snake oil. Also, you supporting claim of drug legalization crippling economies is also pure delusion. Canada has decriminalized marijuana, and their economy seems to be doing just fine. What country has legalized drugs only to be "brought to their knees"? Drugs are illegal because we view their use as immoral not because legalizing them would devastate our economy. That out of the way, I wish someone would study the effects of wind generation at a low level like this also. Obviously those winds are much more robust, but (IMHO) there must be a danger point somewhere that (at least locally) should not be crossed. Obviously those winds are much more robust, but (IMHO) there must be a danger point somewhere that (at least locally) should not be crossed. Do you understand how much energy is available in wind? Concerns over catastrophism from harvesting winds are ridiculous. We already have mega-disasters caused by 100% natural wind events as it is, so it's not like removing energy from the atmosphere would hurt anything any worse. Humans use 17 Terawatts, which is 536 million TeraJoules. Katrina's 10m elevation, 1 minute Sustained winds were 78m/s. Using power formula, that gives 284,000 Watts/M^2 in the eye wall. Which is the equivalent of 323 Horse-Power per yard square. That makes the author's concern about some sort of climate disaster caused by harvesting winds look ignorant. Actually drugs are illegal because of US asset forfeiture laws. Since the expansion of customs law, where the "property itself is guilty," the US and state governments have created various "wars" like crime, drugs, terrorism etc. which all amount to stealing your "guilty" property without a warrant. It's a form of authoritarianism where the police take over the role of the thieves and gangs. The idea of harvesting such wind energy is absurd, and many reasons for that fact are presented here. To quote: "The high winds were thought to be a rich potential source of renewable energy. However, their speed is due to the near absence of friction and not to strong propulsion, which would be necessary for high-output wind turbines. 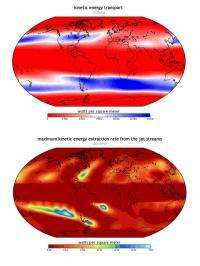 Using climate simulations, the researchers also discovered that the climate system could be subjected to massive change if large amounts of energy were taken from the jet streams." The authors seem to want it both ways: saying harvesting a lot would be harmful, yet, in same breath, saying its impossible to harvest significant amounts. Ya cant have it both ways gentlemen! That's just a 20km wide cross section. The whole storm had a 200 mile radius of TS winds I won't even begin to bother with. Point is, this study misses the point. It doesn't really get much worse than Katrina, short of Hypercanes, and of course, we've had Category 5 hurricanes naturally forever. More likely, pumping so much CO2 into the atmosphere probably will make much stronger hurricanes, but then again, CO2 heats the lower troposphere and oceans while cooling the stratosphere, so no brainer. Natural disasters vs what? A wind-turbine generated disaster? LOL?! The Japan Earthquake, which was not at all caused by man, was rated at 9800 gigatons of TNT equivalent (4.18 megajoules per KG). that's 9.8 Quadrillion kilograms, and each kilogram is 4.18 megajoules. That's 100 times more energy than humans used in a year in 2011, and at least 2 times more energy than humans have used in all of the history of the Earth. What can these bozos possibly imagine a few wind turbines accidentally causing? @Nano: No, you are making yourself look ignorant. Try reading the article before blowing your top off, hu? They are talking about the JET STREAMS!, not where any current turbines operate now. "At heights of 7 to 16 kilometres". As to my comments, i'm just curious what the total number would be, because it has to have some finite limit somewhere. Not that we could ever come close to actually reaching it, but i'm just curious about it. Well, it was a cool idea, but once again we come back to the most likely conclusion - solar panels. Stealing energy from High winds would cause massive severe climate change. Stealing energy from waves and ocean currents and wind likewise will have detrimental climate effects. Just like popping a mountain range or a continent into the ocean would change climate around the globe so too all this harvesting of energy formally devoted to transporting weather around the planet. In extreme case imagine extracting all natural energy from the environment. We would have net effect of no wind no waves and constant climate at all points. Might be cause of massive world wide droughts. @Issacsname: I know CF is a pipe dream. Right, understand the difference between legalizing drugs and decriminalizing. You obviously can't see that many people have jobs that are directly related and dependent on the fact drugs are illegal, from treatment to prison and much, much more, it doesn't just put money in dealers' pockets. And that money is a vital part of the economy, regardless of what side of the coin it comes from. How about the 5-7k it brings on the East coast ? How about 100 pounds ? Or 500 ? The problem here is people like you who have no experience in the trade are clueless about how much money it injects in economies, that's just due to your ignorance. 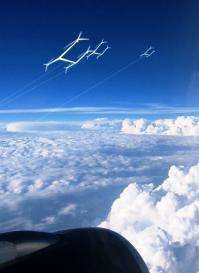 The article left me wondering what would be the effect on the climate if jetstreams were reduced or eliminated? Would temperatures average, or become more extreme. Precipitation? Effects per geographic region? At different altitudes? Over water vs. over land. Cloudier or more sunny? Could ocean temperatures be affected? I do not believe that there is any such thing as a renewable energy source. You cannot create energy it can only be converted into a different form. Removing energy from an environment has consequences. Burning coal and oil results in pollutants. Bio ethanol seems to be a renewable source but is it? The materials we ferment to produce the ethanol derive their energy from the nutrients in the soil which have to be replaced or the depleted land becomes just another sterile desert. Where do the replacement nutrients come from? Phosphates are mined as are nitrates or produced from waste products none of which are in the end renewable. Even energy from the wind or waves may have consequences we are not yet aware of you cannot subtract energy from a system and still have the same quantity available. Once consumed it is gone 'renewable energy' is as much a myth as 'anthropogenic global warming'. yeah, because those stoners who are buying it would just burn their money instead of buying another xbox game? This isnt a zero sum game, sorry. Besides if it were legal the money wouldn't be flowing back into Mexico, it would be flowing into US farmers. Plus the money would flow more freely if you could use your visa debit to make the purchase, which would increase the velocity of that money, multiplying the effect. Drugs being illegal has NOTHING to do with avoiding some economic melt down caused by making it cheaper. NOTHING. Can some mod come by and just delete all these pointless off topic posts, this one included? Oh wait, that would require physorg to hire some mods... damn it. Well, my stance is that the quasi-legality of many recreational drugs is a backbone of our economy, local, national and international, or at the very least, a few ribs and a collarbone, I stand by that and could offer many examples, but like you say, completely OT. As far as the premise of the article, sucking the energy out of the atmosphere and throwing weather patterns into chaos, I doubt we would be able to get to the point where we were harvesting that much from the upper atmosphere, it would require too much trial-and-error testing. By the time we could pull it off, we'll already have developed better sources of energy. Besides, imagine what will happen the first time a flock of those things drops out of the sky on a residential area, or a downtown metropolitan area like NY city. A bunch of them flying on tethers in the same space would be asking for a disaster. ..., and the direct economic harm to the drug purchaser who by purchasing a high-priced black market item has less to spend on other items (including important "self-maintenance" items like food and health care). There's also a strange economic effect due to difficulties laundering money in a reasonable amount of time, causing large amounts of cash build up, like the $207 million found in a Mexican house http://www.snopes...oney.asp . This money is not circulating in the economy, and therefore isn't being loaned to spur new businesses, etc.. By focusing solely on the higher price of drugs when illegal, you have ignored the damage it does to the reset of the economy.